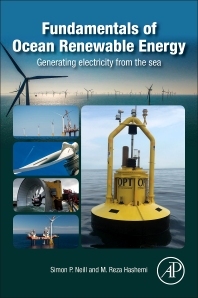 Fundamentals of Ocean Renewable Energy: Generating Electricity from the Sea presents the basic concepts of mechanics and introduces the various technical aspects of ocean renewable energy. Contents follow a logical sequence, starting with hydrodynamics and then separately examining each conversion technology, with special focus on tidal energy, offshore wind and wave energy, as well as current and ocean thermal energy conversion (OTEC). The authors explore key topics for resource characterization and optimization, such as monitoring and measurement methods and ocean modeling. They also discuss the sustainability, planning, integration and distribution challenges for the implementation of these technologies, including co-location with other systems. Finally, case studies of ocean energy sites and devices allow for a better understanding of how ocean energy conversion works in real-world settings. This book is an invaluable resource for students at graduate and senior undergraduate level engineering (ocean, mechanical, and civil) and oceanography with prior knowledge of fluid mechanics and mechanics of materials. Engineers and scientists who are working in industry/academia in related areas and are willing to move toward marine renewable energy, and need an introductory reference book. Graduate and senior undergraduate level engineering (ocean, mechanical, and civil), and oceanography students, who take courses related to Ocean Renewable Energy. Simon Neill is a Reader in Physical Oceanography at the School of Ocean Sciences, Bangor University (UK), and is founder and course director of an MSc in Marine Renewable Energy. He was awarded a BEng in Civil Engineering from the University of Dundee (1997), and a PhD in estuarine physics from the University of Strathclyde (2002). He has published around 70 peer-reviewed journal articles, half of which are on the topic of marine renewable energy. He is involved in many national and international projects, and is a committee member of the International Electrotechnical Commission (IEC), working on revising IEC Technical Specification 62600-201: Tidal Energy Resource Assessment and Characterization. M. Reza Hashemi is an assistant professor, in the Department of Ocean Engineering and Graduate School of Oceanography at the University of Rhode Island, USA. The University of Rhode Island is the birthplace of the first offshore wind farm in the US: the Block Island Offshore Wind Farm, and has several centres for teaching/ research regarding renewable energy. Hashemi has published over 35 peer-reviewed journal articles, mainly focused on ocean renewable energy and coastal engineering. He has developed and taught several undergraduate and graduate courses about renewable energy, and one of the motivations for this book was to provide a textbook for these courses.